I guess I should talk about the magic that is Red Velvet Cake for a minute. If you’re from the south like I am you have had just about every variation of it. Actually Red Velvet Cake is just one of those classics, so you really don’t even have to be a southerner to have grown up with it. Everyone’s mother, grandmother, great-aunt, first cousin Judy has a red velvet cake recipe. Some people swear by nuts, some people don’t. Some people are heavy on the cocoa, some just add a pinch. Then there’s the butter vs. oil debate and lets not even get into the color (It should be bright red, No it should be dark). It can go on and on, but the point is you have had every version at some point. Fair to say some good and some not so good. It’s just one of those cakes that people get really persnickety about. This is why we will save that debacle for another day and just stick with these amazing waffles for now…. Does anybody else feel slightly guilty eating cake for breakfast? I know I’m a grown lady (which is debatable sometimes) but I still feel a twinge of guilt. Don’t get me wrong im not gonna stop …lol… at this point I have just accepted it. I’m not talking about coffee cake or little dainty glazed tea cakes these are acceptable, im talking about waking up in the morning and remembering you have a delicious and sinful frosted hunk of goodness sitting in your kitchen. This is a judge free zone and because it is I can tell you that yes I have sat at my dining room table with a big hunk of cake and a cup of coffee on a Saturday morning. So to assuage some of my guilt I decided to just turn one of my favorite cakes into a breakfast food…well…..it’s in the breakfast food family anyway. There are always loopholes people. So yes I made Red Velvet waffles. 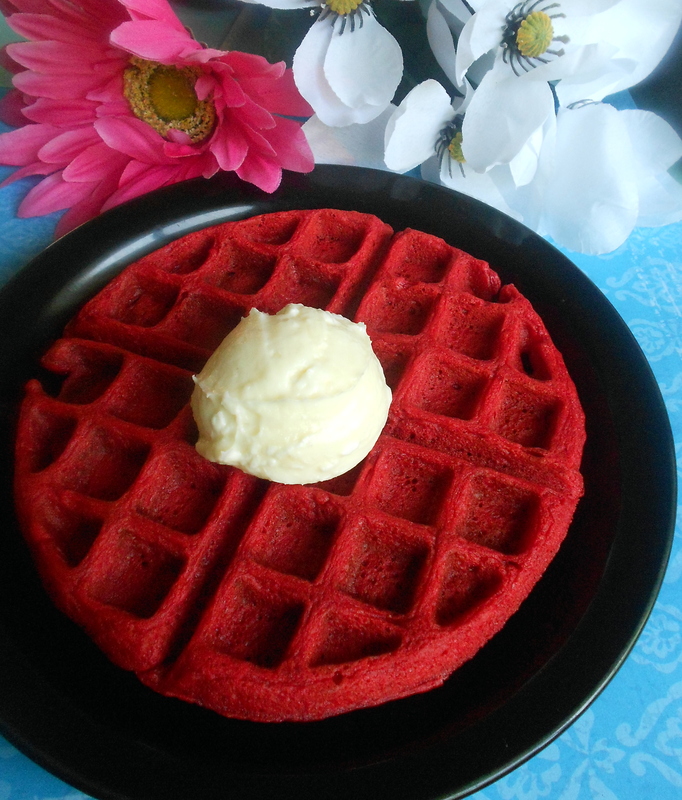 Red velvet cake meet Waffles…..Waffles meet Red velvet cake. I think you two will be very happy together. The first time I made these waffle it was really just a whim. My mom was staying over and I knew I was going to make us breakfast in the morning and I was just in the mood to switch it up. So a quick glance in my cabinets and fridge and a look at the shiny new waffle maker my mom had gotten me for my birthday (and also a quick internet search) and Red Velvet Waffle it was. I even whipped up some cream cheese frosting to dollop on the top. I knew it was a winner when I got the thumbs up from mom, especially since red velvet cake is her favorite. So it seems only fitting to share this recipe around Mothers Day. In a medium bowl whisk together buttermilk, eggs, butter, vanilla, white vinegar and food coloring. Pour the buttermilk mixture into the flour mixture and stir gently until combined. You can whip up a batch of cream cheese frosting if you want or just drown them in some good ol Maple syrup. However you decide to eat them Enjoy! I wish I could say that every recipe I post is carefully thought out and planned but that’s really not the case. Some of them are and some of them just come from raiding my kitchen and seeing what kind of ideas pop in my head. My mom often calls this “Iron Cheffing”, it’s something we came up with when dinner ideas started to get a little boring and she would send me in the kitchen to raid the fridge and pantry and see what I could come up with to spice things up. It was always fun and we had some pretty creative and delicious dinners. Although we made this into a fun thing to make dinner more exciting the basic principle came from something my grandmother used to say which is “Stir with what you got”, meaning you make due with what you already have. It applies to so many aspects of life and if you use you would be amazed at the results. Sometimes I think we get so obsessed with the new and shiny that we often take what we already have for granted. So when I saw a couple of bananas that needed to be used up sitting on my dining room table I knew I had to come up with something. The obvious choice of course would be Banana bread which I could have made but I felt like I wanted to try something different, plus I’ve been wanting to play with the chocolate, banana and peanut butter flavor combo for a while. 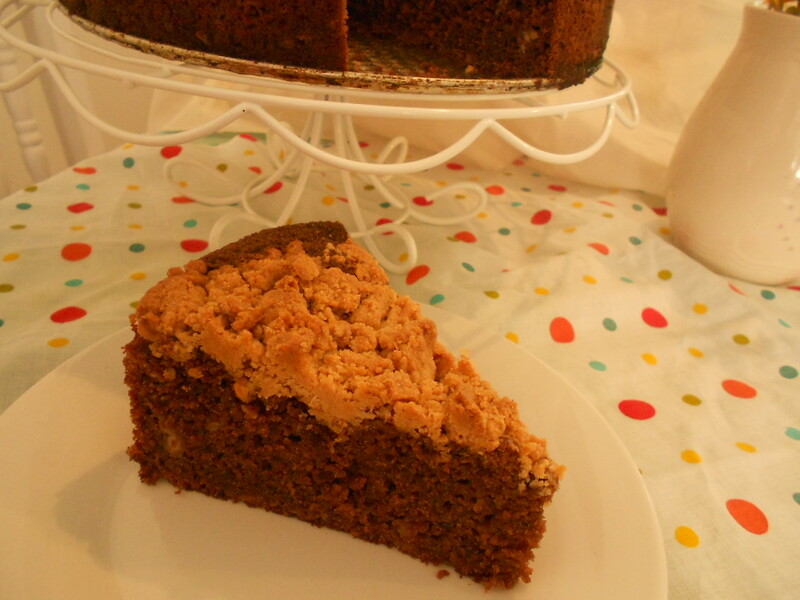 So a quick kitchen raid and a quick internet search and you have Chocolate Banana Coffee Cake with a peanut butter streusel topping. I was so excited about how good this coffee cake came out and if you follow me on instagram you know just how excited. I was posting pictures of this baby left and right. There’s this possibly dorky giddy feeling I get when I bake something new especially when it’s a success. I can’t wait to share it and I will definitely be making it again. Preheat oven to 350 degrees. Generously spray a 9 inch springform pan. For the streusel: In a medium bowl combine the flour, peanut butter, sugars, melted butter and salt. Mix with fork until crumbly. In bowl of electric mixer cream the butter, sugar and brown sugar on medium high speed until fluffy. Add the eggs one at time, making sure each egg is fully incorporated. Add the vanilla. Add the banana and sour cream. Add the flour mixture and mix until just combined. 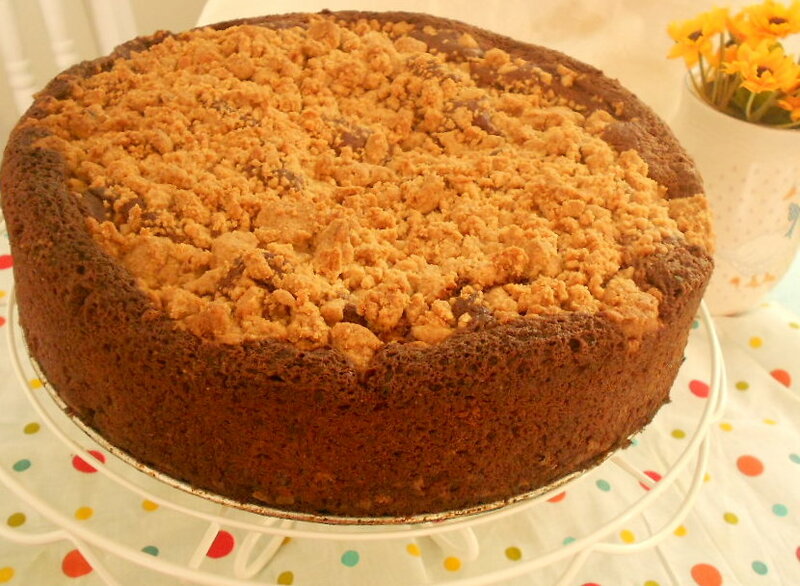 Scrape batter into prepared springform pan and sprinkle the peanut butter streusel over the top. Bake for 55 minutes. Cake should spring back when lightly touched or toothpick inserted in the center should come out clean. Let cool for about an hour before attempting to remove from springform pan. I love bread!! I really really love bread! Especially warm and slathered in butter, not the healthiest but we all have our vices. I decided to embark on the task of homemade bagels for a couple of different reasons. The first being that I have always wanted to be able to master them at home because 9 times outta 10 homemade is way better than store bought. Second being that with such a simple ingredient list it just seems more economical (that is if you have the time and patience) than the store bought. And the Mocha Baker Girl is definitely on a budget right about now so ECONOMICAL GOOOD!! I love the bagels chewy texture very similar to that a soft pretzel (which I love so much, don’t even get me started). In bagel making you would think the most intimidating part of it would be working with yeast, but that wasn’t the scary part for me. I’m not really scared of working with yeast. I’ve played with it so much over the years and I’ve had triumphs and failures but at this point I’m kind of comfortable with it. The Intimidating part for me was the boiling process. It just seemed like so much… basically like a recipe for disaster (*clears throat*…..no pun intended). So Homemade bagels just went on the “One Day List” and I could be wrong but I think all of us foodie types people have a “one day list” or you may call it something else but it’s basically a list of stuff you want to make but are too intimidated to try. It could be anything from Coq Au Vain to Homemade croissants. I finally got the courage when my intense need for pretzel buns for my burger outweighed my fear of the dreaded boiling process. Thanks stomach. And guess what? , it wasn’t that bad. So yes I used pretzel buns as my gateway, they turned out great and my burger was amazing and I was left feeling like I can do this. Although my favorite bagel of all time is the Everything bagel I decided to keep it as simple as possible for now but my next batch will definitely be everything. Pour warm water into the bowl of an electric mixer and sprinkle the yeast on top. Let mixture stand for 5 to 10 minutes or until foamy. To the yeast mixture add Corn Syrup, Molasses, Sugar, Oil, Flour and salt. Using the dough hook attachment mix on low speed until combined and shaggy dough begins to form. Increase speed to medium high and knead for 10 minutes until dough is elastic and smooth. Turn mixture into a large greased bowl and cover with a damp towel or plastic wrap. Place in a warm dry place to proof for 30 to 45 minutes or until doubled in size. When dough has doubled in size, gently push down to remove excess air and divide the dough into 8 equal pieces. Roll each piece into a ball. Taking one finger , coat it in flour and press it into the center of one of the balls of dough (making a hole in the center) and gently stretch to about 2 inches in diameter by twirling the dough around your finger or just gently pushing out from the center. Repeat this process with each ball of dough. Place each formed bagel on a sheet pan that has been lined with parchment paper, greased and sprinkled with cornmeal. Cover with damp towel or gently with plastic wrap and let sit for 15 to 20 minutes. Fill a large pot with the 12 cups of water and bring to a boil and stir in Molasses and Baking Soda. Very gently place bagels in boiling water only about two at a time and let boil for 1 minute, flip bagel over and let boil for 1 minute on the other side. Using a slotted spoon remove bagels from water and try to let as much excess water drain off as possible. As you remove bagels from water you can place them back onto the greased cornmeal sheet pan. 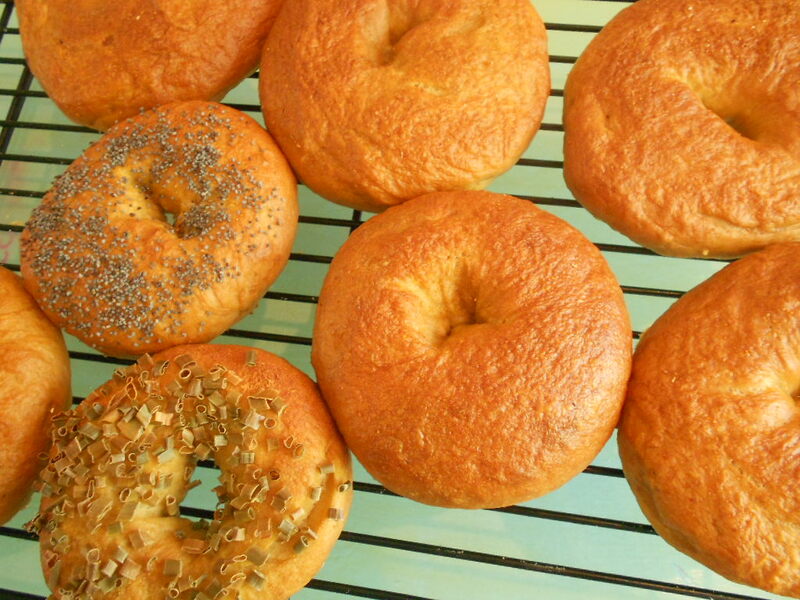 At this point if to have any toppings such as poppy seeds or sesame seeds you can sprinkle them onto the bagels. Place in a 400 degree oven and bake for 20 minutes or until golden brown. This officially my 6th blog post!! I’m getting a lot of support and love from my friends and family and it really makes me feel good. I have wanted to do this for so long and it just feels good to finally be doing it. I’m excited to grow and learn and to have you all along for the ride. And now to the sweets……. I’m just gonna be honest. This bread was basically another excuse to eat chocolate for breakfast ( I have a small obsession with Kellogs Krave cereal). I’m a total chocoholic. Just about all my favorite flavor combos include chocolate, Chocolate and mint, chocolate and peanut butter, chocolate and strawberry and of course chocolate and cherries. I can devour a box of cherry cordials in an embarrassingly short amount of time. 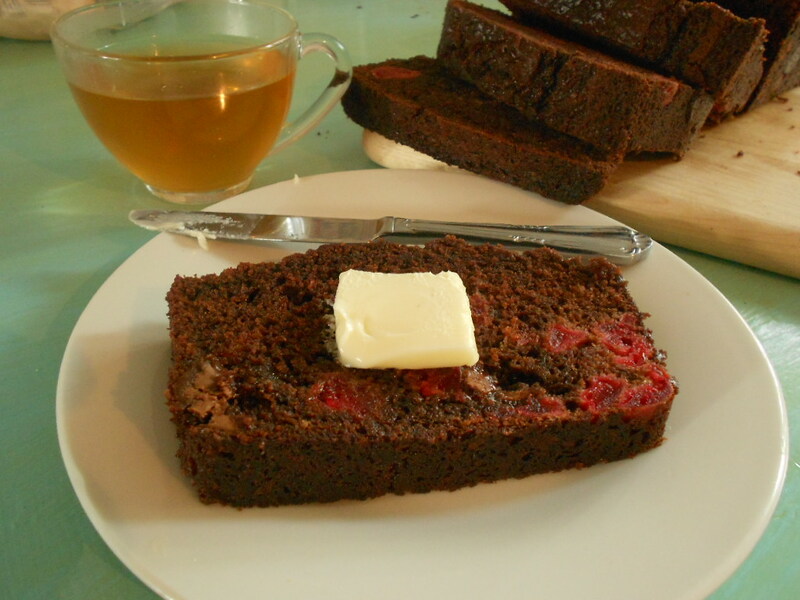 I have wanted to do something with the chocolate cherry combo for a long time and this bread is basically a cherry cordial in breakfast bread form. Its soo good! I have to admit I was kind of nervous about how this was gonna come out but I couldn’t be happier. 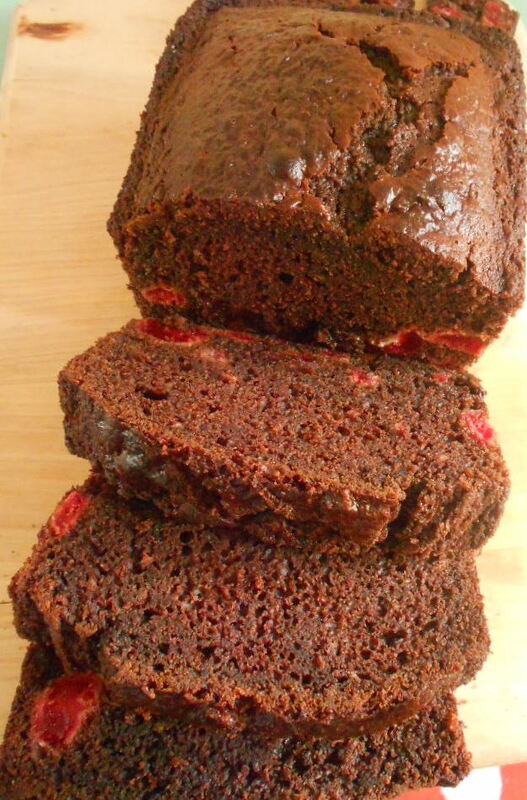 It is chocolaty cherry moist goodness (Yeah I know but I just had to say it). So slather it butter, cream cheese or whatever you like and let’s have chocolate for breakfast! Preheat oven to 350 degrees. Spray a 9 x 5 inch loaf pan with non-stick spray and set aside. In a large bowl whisk together flour, cocoa powder, baking soda, baking powder, salt and sugar. In a medium size bowl whisk together eggs, buttermilk, oil, cherry liquid and vanilla. In another small bowl toss the chopped cherries in the remaining ¼ cup flour and set aside. Pour the wet ingredients into the dry and gently fold until no visible clumps of the flour mixture are left. Gently fold in flour coated cherries and chocolate chips. Pour batter into prepared loaf pan and bake for 55 to 60 minutes or until toothpick inserted in the center comes out clean. Allow bread to cool in the pan for 10 to 15 minutes and then gently turn it out onto a wire rack and let cool completely.